Baseball and marketing are similar in that both are about numbers and personalities. The same way baseball managers have replaced feelings with data, so too have savvy communicators — directing content strategy and even brand direction with ideas and plans backed by empirical social insights. According to the Pew Research Center¹, nearly two-thirds (65 percent) of American adults are using social media, a rise of 7 percent from 2005, when Pew began measuring social media use. A study by Yesmail², found that 90 percent of retail brands are using multiple social channels and the same number are using Twitter and Facebook. Even B2B marketers are finding social media valuable as a business tool. A Social Media Examiner study in 2015 found that 63 percent of B2B businesses said social media helps them build a loyal audience³. In 2016, it is projected that social network ad spending will reach $35.98 billion globally, or 16 percent of all digital ad spending4. As your spend shifts to digital, are your methods shifting to take advantage of the insights that can be gained from social data? For example, are you planning your campaigns with persona insights from the outset, or are you just learning on the fly? What this white paper explores is how you can use data generated from social media to manage your programs more effectively based on the persona of your potential customers. To paint that picture, we have analyzed seven Major League Baseball (MLB) teams; The New York Yankees, Boston Red Sox, Chicago Cubs, Chicago White Sox, San Francisco Giants and the Toronto Blue Jays. We examined the social media mentions of 8,386,000 baseball team Twitter followers to determine their interests, demographics and regions —right down to what sort of food they most often discuss. 1. The New York Yankees are the most recognizable brand of the seven Major League Baseball teams that we analyzed with more than 350,000 followers from countries outside of North America (United States, Mexico and Canada). When you know more about the people who follow your competitors, your industry and brands that are affiliated to both, you can build a plan that doesn’t rely on luck, but appears to generate it. 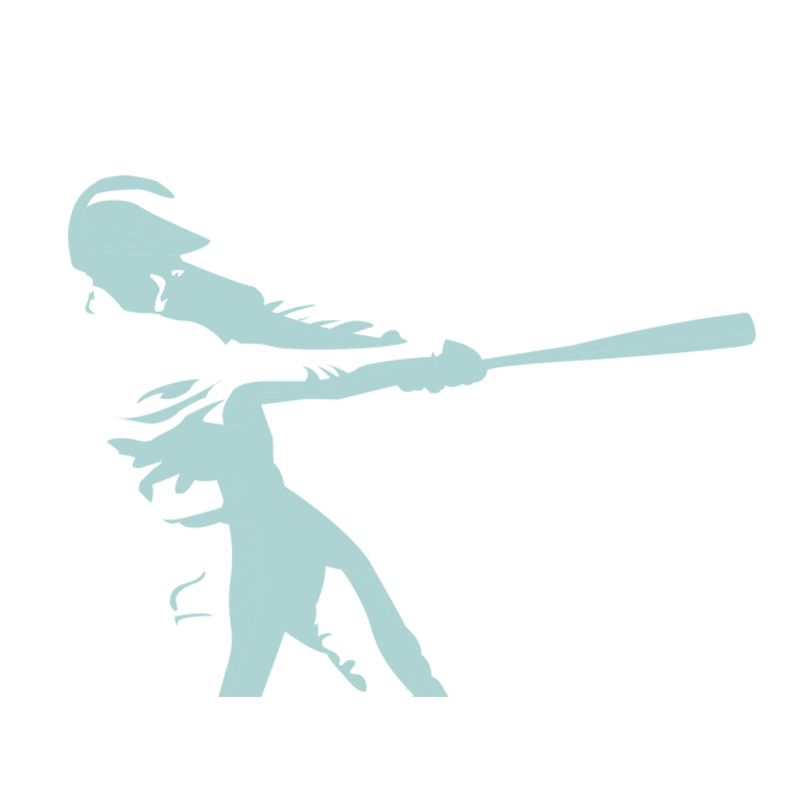 Hit a home run with your brand strategy request a consultation of Cision Global Insights today! Our analysis looked at three key points for any brand that wants to build a social persona of its follower base or that of its industry. The goal with conducting a social persona audit for your brand should be to provide real-time insights that go beyond measuring the performance of your content and into understanding the interests, activities and beliefs of your target audience. You might think you know your market, but even if you have data on a municipal level, there can be enormous differences between peoples’ interests and activities. Your audience won’t become advocates of your brand or content unless you throw a pitch they find attractive. All of the teams’ follower groups we measured had larger shares of men than women. The New York Yankees and the Chicago White Sox had the most male followers with 64 percent, and the San Francisco Giants had the most female followers 44 percent, which is closest to the Twitter baseline of 47/53 percent men versus women. We excluded followers who we identified as brands. This is an important distinction for brands seeking to reach businesses, or for consumer brands that don’t want to target other companies. All seven of the teams had between 6 – 11 percent businesses as followers, with the Red Sox and Blue Jays having the fewest brands following the teams at 6 percent and the Yankees, Giants and White Sox having the most at 11 percent. The Toronto Blue Jays showed the greatest percentage of followers within three demographic ranges, 18-24, 25 – 35 and the 35 – 44 year old groups. The team also had the fewest followers found within the < 18 range. Depending on your industry, different generations have more or less value. New car buyers tend to skew toward the > 54 demographic, meanwhile Generation X or those between 35 – 44 years-olds represent 31 percent of all income dollars generated – each team we measured can target different generations more accurately. If you want to invest in Twitter advertising targeting sports team followers, consider the Giants. If you want to reach teenagers, use the Yankees. Of all the teams measured, the New York Yankees had the largest international follower base. Each team retains more than 70 percent of its followers from its home country; however, 19 percent of New York Yankees followers are found outside of North America, the greatest proportion of any team monitored. The Yankees also have the most followers of any team at 1.86 million. This implies that the Yankees have the most recognizable global brand with 353,400 followers from outside of North America followed by the Toronto Blue Jays, Boston Red Sox and San Francisco Giants. All seven teams’ largest followers groupings were from the same four top nations, the United States, Canada, Mexico and the United Kingdom. Take Away: While any brand has its own home team advantage, there can be significant audiences found outside of a specific region or industry group. The largest proportion of team followers are found in home cities, ranging from 31 percent of followers from Chicago for the White Sox, to 12 percent of followers for the San Francisco Giants. While the Giants have the fewest followers based strictly within its home city, it has the second greatest dispersion among multiple cities. We quantified a significant audience from within a city when it reached 1 percent of the total audience share. The Blue Jays had the greatest, with a predominance of Canadian followers from across the country, being the nation’s only MLB team. To build an understanding of the makeup of each team’s follower base, we evaluated the top 20 interests of their followers. We looked at users’ affinity toward entertainment mediums such as sports, television, music and news media consumption to get a big-picture view of the groups’ interests. 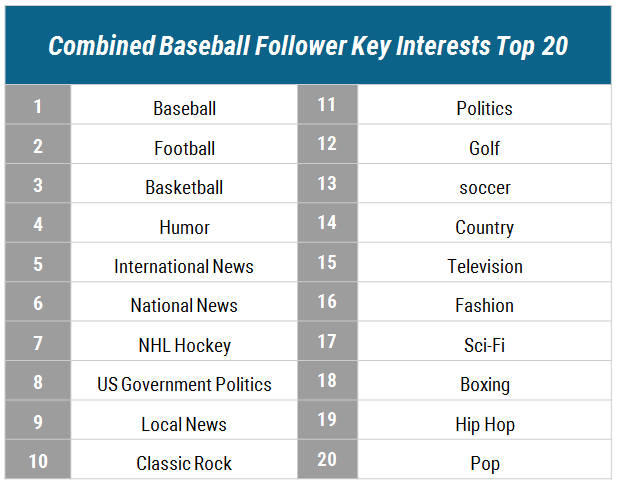 Not surprisingly, baseball team followers were extremely interested in other sports, with team followers discussing football and basketball 200 percent more often than the average Twitter user. Team followers also loved humor, comedians and comedy. With the exception of the Toronto Blue Jays followers, all team follower groups discussed humor more than 64 percent of the time, nearly double the Twitter average. Baseball team followers had the greatest affinity toward National Football League (NFL) football and National Basketball Association (NBA) basketball, and the lowest affinity for professional soccer and boxing. The White Sox followers discussed NHL Hockey more than any other team with 64 percent discussing the league compared to just 7 percent of general Twitter users. That means White Sox fans are 885 percent more likely to discuss the NHL than the average Twitter user. 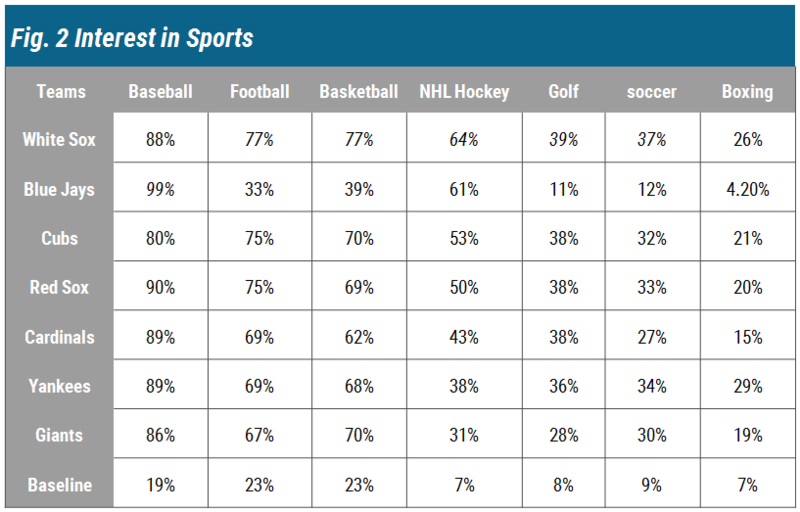 White Sox fans were also the most likely to discuss golf, basketball, football and soccer. Yankees fans were most likely to discuss boxing. While all of the followers engaged with their teams, slightly fewer actually discussed baseball. Toronto Blue Jays followers are the most likely to actively discuss baseball, with 99 percent discussing the game compared to just following the team. On average, 90 percent of baseball team followers discussed baseball during our measurement period, compared to 19 percent of the Twitter average, making team Twitter followers 373 percent more likely to discuss the sport than the Twitter average. Musical taste varied geographically and demographically amongst the groups we studied. We measured pop, hip-hop, country and classic rock. For pop, only the Toronto Blue Jays fans reached or beat the 35 percent baseline average, with all others far below. For hip-hop, both the Toronto Blue Jays and the New York Yankees approached the Twitter baseline average of 24 percent. 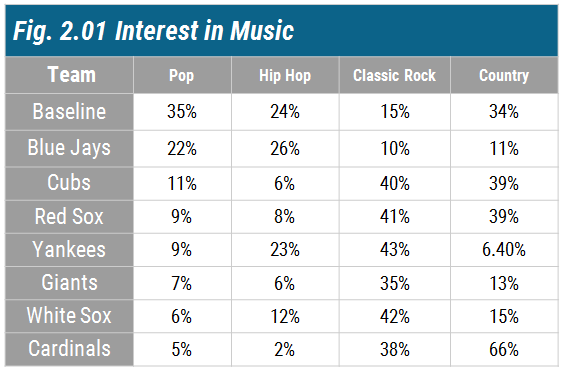 Meanwhile, classic rock showed the greatest overall share of interest between all of the teams, save for the Blue Jays fans’ fondness for hip-hop and the Cardinals fans’ appreciation for country. Cardinals followers also had unique affinity toward discussing country music: 66 percent of their followers discussed country, which makes them about 100 percent more likely to do so than the average Twitter user. If you want to get Blue Jays fans excited, play Drake. To impress Cardinals fans, turn up that Kenny Chesney. Baseball team followers are certified news junkies. They follow local, international and national news with a greater likelihood than the average Twitter user. For both the Yankees and the Blue Jays, we noticed some crossover between the local news market and the international news (in the case of the Yankees) and national (in the case of the Blue Jays). The Toronto Star is Canada’s leading newspaper, which covers the Blue Jays thoroughly as does The New York Times with its city’s team, the Yankees. In other news, the Cubs, White Sox and Cardinals fans had the greatest focus on local news, while the Yankees and Giants have the greatest interest in international media. Beyond news, baseball followers enjoy science fiction, humor and television, with humor ranking fourth overall among all interest topics measured. When we looked deeper into which comedian fans discussed most often, we noticed an intersection between Jerry Seinfeld and all seven teams. While all of the teams’ followers beat the baseline in discussion of humor, they also beat the baseline by as much as 900 percent in their discussion of Jerry Seinfeld. Understanding what makes your target audience laugh can help guide decisions around marketing partnerships. 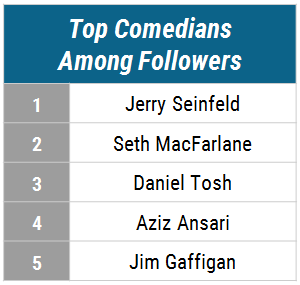 Further analysis found that many American comedians ranked with greater affinity in this group than the Twitter average. By combining the percentage of comedy interest among all of the teams we were able to produce a ranking of the top five comedians most appreciated by fans of these teams. Even within a single city, differences exist between niches regarding interests in food or entertainment. As an example, followers of the Chicago Cubs have a 90 percent great affinity to Chinese food than followers of the White Sox. 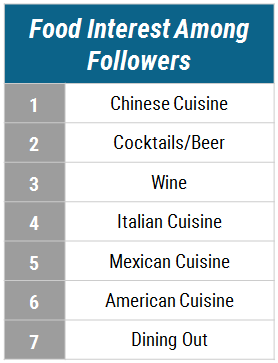 When we combined interests across all of the teams, Chinese food, beer and cocktails (as well as wine) comprised the top three food and beverage choices among followers of the teams we measured. The regional differences among our measured teams are most pronounced in wine country. Followers of the San Francisco Giants had nearly double the baseline average interest in wine. This beat every other team measured. As evidence of Giants fans love of wine we can turn to Twitter, where we find a veritable side industry offering Giants branded cheese boards, portable wine coolers and even bobble head wine stoppers. Despite the growth of social media, television is still an incredibly valuable medium. Increasingly however, consumers and brands are combining both. Accenture reported in 2015 that 87 percent of consumers 5 are using a second screen while watching TV. Knowing where your social audience spends its TV time can direct where ad-spend is invested to boost social engagement and even drive sales. 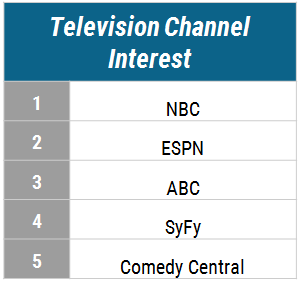 When we looked at our groups and aggregated television interests, NBC edged out Fox, ESPN and the Comedy Central were shown to be the most followed and discussed. The San Francisco Giants fans were the least likely to have an interest in ESPN; however, the team’s followers still out-watch the average Twitter user by close to 400 percent. If your brand wants to reach baseball audiences but isn’t disposed to market directly at sporting events our analysis suggests that Comedy Central, or SyFy, may be worthy of your advertising budget. Similarly, if you knew that close to half your audience watches television shows about space aliens, it could help you tailor your marketing creative to target that group and engage them based on their interests. Baseball followers are obviously very interest in baseball reporters and players but this crosses over between sports as well. For instance, basketball Hall of famer Magic Johnson ranked fifth overall in our combined analysis of leading influencers. 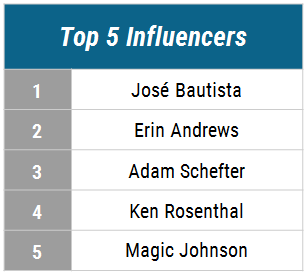 However it is Blue Jays’ all-star outfielder José Bautista who took the first place in our combined ranking of influencers. Sports journalists, hosts and commentators represented 40 percent of the top 10 influencers for the followers of teams represented in our analysis. Erin Andrews, Adam Schefter and Ken Rosenthal all made the top five in our combined analysis, indicating the overwhelming influence of sports journalists on the social media conversation. Take the guess work out of your marketing and communications plans. Contact Cision Global Insights today to learn more about the audiences your brand needs to target.